One of Scotland’s oldest and continuously inhabited castles has taken a serious conservation problem and turned it into a unique opportunity for graffiti artists. 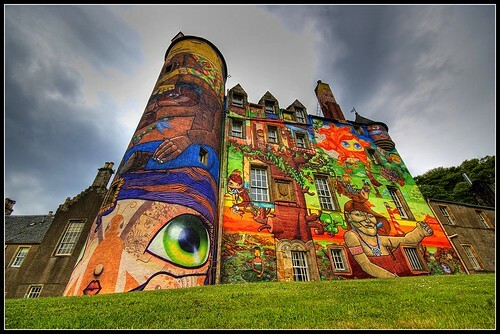 In 2007 it was found that the concrete facing on the castle’s stone walls would need to be replaced so the current Earl of Glasgow invited four of Brazil’s leading graffiti artists along with several Scottish artists to create a unique collaborative artwork over a one month period. The artwork was to be in situ for two years.